Japanese man arrested for kicking SoftBank Pepper robot. 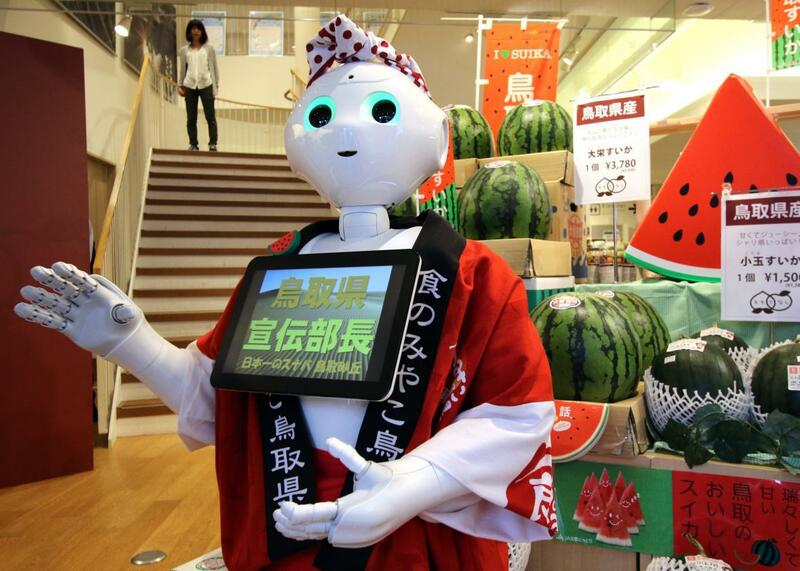 Pepper selling watermelons last month in Tokyo, unaware that bystanders could be plotting kicks or other abuse. Japanese telecom SoftBank started selling its emotion-detecting robot, Pepper, in June for about $1,600. The first batch sold out in one minute. But even with so much enthusiasm for owning Peppers or interacting with them at SoftBank demos around Japan, there’s still always going be that guy. He’s drunk, he’s angry, and he kicks a robot. Typical. The Japan Times reported on Monday that police had arrested 60-year-old Kiichi Ishikawa at a SoftBank store for “allegedly kicking a Pepper robot in a fit of rage.” Kanagawa prefectural police told the Times that Ishikawa had admitted to destruction of property after explaining that he was frustrated with a store clerk. He took it out on Pepper, not the clerk, though. Police obtained security footage that shows Ishikawa’s drunken robot kick. And apparently it actually did some damage. The Pepper unit now moves more slowly, and its internal processor may be damaged. Researchers have investigated the scenario where children abuse robots, but maybe it’s time for that line of inquiry to extend to a related population: drunk people. You can see how taking out anger on a humanoid robot could feel satisfying without risking an assault charge, but it’s probably not the healthiest (or cheapest) way to deal with emotions.